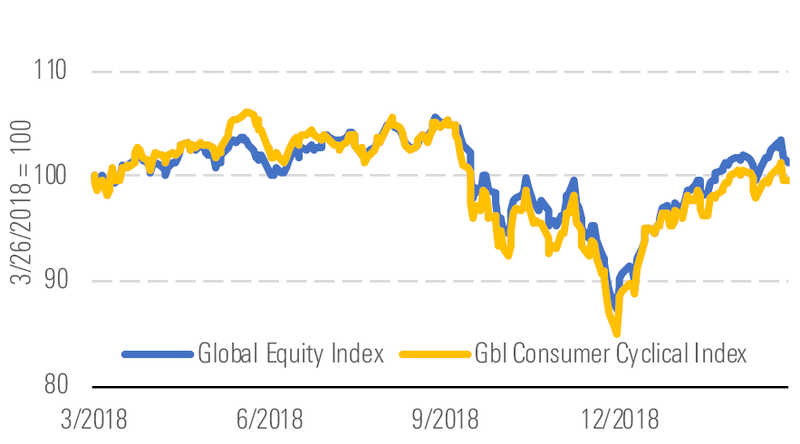 Through March 25, the Morningstar Global Consumer Cyclical Index has rebounded 11% from its recent lows of late December, roughly in line with the broader global equity market. That said, the sector remains 6% below its June 2018 peak, as concerns around global growth amid a slowdown in China, Brexit uncertainty in the U.K., trade tensions with U.S. partners, and political protests in Europe have weighed on consumer cyclical performance. Erin Lash, CFA does not own shares in any of the securities mentioned above. Dan Wasiolek does not own shares in any of the securities mentioned above. Find out about Morningstar's editorial policies.